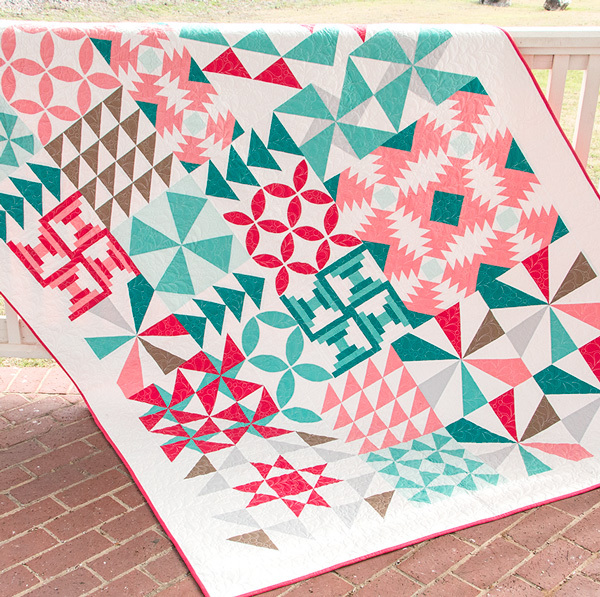 A new Fat Quarter Shop Bella Basics QAL kicks off today! I am so excited to play along! I'll be using this yummy bundle of solids in several shades of blue plus a few extra colors for some interest. You can find the video tutorial and free pattern for this month's blocks - Kaleidoscope -on the Jolly Jabber blog. To create the block, you can use either a specialty ruler (spider web ruler) or use the free template supplied free with the pattern. The template worked just fine. I taped it to a ruler, aligning one edge of the template to one edge of the ruler. Once the pieces for the larger block was cut out, I trimmed the template and cut out the pieces for the smaller block. I used colors sea (138) and teak (129) for this months blocks. Fat Quarter Shop has a kit available for this project as well! Grab your free pattern for the Kaleidoscope block here. There are several bloggers quilting along. Make sure you visit them and check out what they are up to as well. Are you quilting along? Let me know!!! New to my blog? Thanks for stopping by! 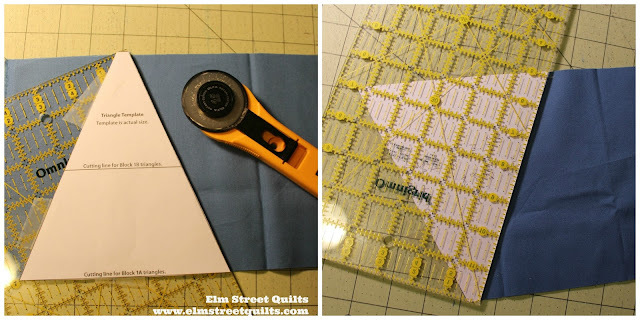 Take a minute to visit Elm Street Quilts One Monthly Goal - a monthly link up party to encourage you towards progress on your quilting projects. Fat Quarter Shop is one of the sponsors! Disclosure - The Fat Quarter Shop provided funding to cover the cost of materials for this quilt. Beautiful blocks. I love the clever way you adapted the template to your ruler! Great colors you chose Patty!! The Kaleidoscope is a neat block. Great idea to tape template to ruler! I made the template, used Frixion pen to outline around and cut the patches. Love the blocks and fabric choices! Those look great, Patty. I'm not sewing along although I loved sewing FW. I have too many projects sitting in tubs waiting for me!! Have a great day. I love your fabric choices and the February blocks you've made. I'm looking forward to seeing your future blocks. Love your fabric choices. Can you tell me how much of each color you are using? Thank you. This is an awesome project. Love learning new skills and revisiting the basics. I'm glad you like it! Can you drop me an email directly so I can answer your question? You commented as a no-reply blogger. thanks! Blues are very pretty. Blocks are nice. These are beautiful solids you have chosen! Looks like a beautiful quilt to sew. Just lovely! I'm not quilting along just now, but may start sometime after I finish some other things. Very fun blocks. 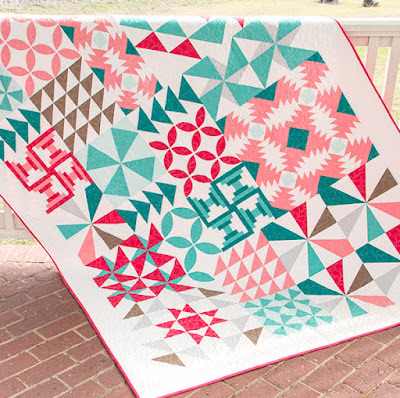 Love your color choices for this quilt along.